*Printed hooded tunic and pants with attached boot tops. Trained to be dark and evil, this Costume is inspired by Darth Maul from the Star Wars series. 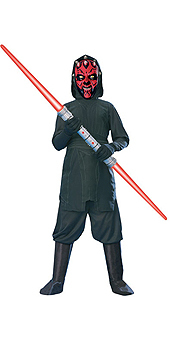 With a printed tunic, pants, boot tops and a mask included, you too can look just like Darth Maul. Scare everyone with your very own PVC mask, with horns on top to finish this amazing Costume. Don't forget about the dark side whilst you're having too much fun in this Star Wars costume!